When entering intermediate grades, students may experience difficulty reading textbooks and informational text due to high-level vocabulary and unfamiliar concepts. In addition to these complexities, students encounter numerous text features throughout the text that often get overlooked even though they have been taught their importance. 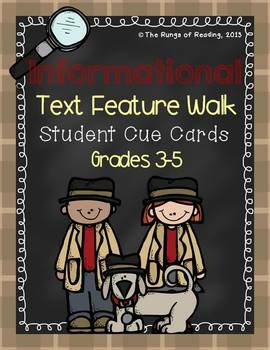 The Text Feature Walk is a technique that explicitly teaches the purpose and importance of text features which enables students to navigate any informational text more effectively. This two-day lesson plan includes teacher modeling, guided practice, and whole-group discussion. These lessons can be used whole-class or as a small group intervention. ELA-Literacy.RI.3.5 Use text features and search tools (e.g., key words, sidebars, hyperlinks) to locate information relevant to a given topic efficiently. 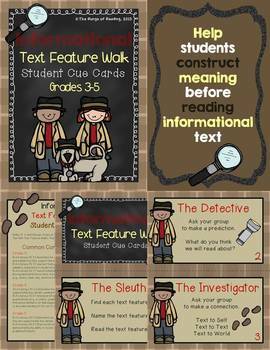 ELA-Literacy.RI.4.2 Determine the main idea of a text and explain how it is supported by key details; summarize the text. ELA-Literacy.RI.4.7 Interpret information presented visually, orally, or quantitatively (e.g., in charts, graphs, diagrams, time lines, animations, or interactive elements on Web pages) and explain how the information contributes to an understanding of the text in which it appears. ELA-Literacy.RI.5.2 Determine two or more main ideas of a text and explain how they are supported by key details; summarize the text. ELA-Literacy.RI.5.7 Draw on information from multiple print or digital sources, demonstrating the ability to locate an answer to a question quickly or to solve a problem efficiently. Thank you for browsing, adding to your wish list, or purchasing from The Rungs of Reading! We appreciate feedback so please leave comments and/or suggestions on our Ratings & Comments tab to earn your TpT credit.